Here is Some Information about Kailash Maansarovar(Shiva) Temple in Darchen Uttarakhand. Location: Mount Kailash in Darchen Uttarakhand. The towering 22028 ft high peak Mt. 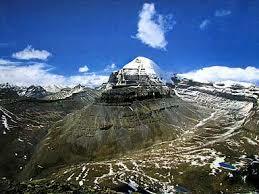 Kailash in the Himalayas, 25 miles north of the Mansarovar lake is hailed as the abode of Shiva. 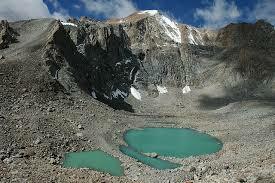 It is an arduous trek to Kailash through the snow clad Himalayas and is attempted only by a few. The Tibetians refer to Kailash as Kangrimpoche (Jewel of Snow). 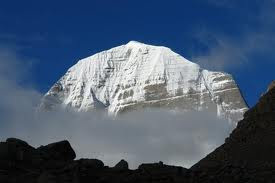 Kailash is also referred to as Hemakootam. 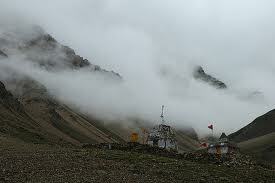 This is one of the 4 Tevarastalams in the Himalayas the other three being Gowrikund, Kedarnath and Indraneela Parvatam. Major rivers have their source around the Manasarovar lake and Kailash. Pilgrims go to Kailash via the Lipu Lekh pass. They first go to Tonakpur, then through Pithorgarh, Askot and Dharchula and Garbiang the last town in Indian territory. The Lipu Lekh pass is 16750 feet above sea level, and is at the Tibet frontier. Pilgrims then reach Taklakot, a Budhist center. Manasoravar is 34 miles away from here. 12 miles from Taklakot in Bhutan, is Kocharnath. An alternate route to Mansarovar is via Kathgodam, Karpot, Milon, Tirthapuri and Kailash. Yet another route is from Haridwar via the Niti pass. 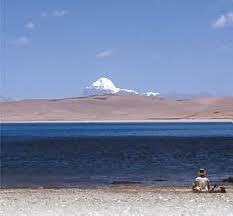 The Mansarovar lake is known as Cho Mapan. There are two lakes here; one the rakshasa tal, where Ravana performed penances towards Shiva, and the other the Mansarovar, considered to be one of the 51 Sakth Peethams. 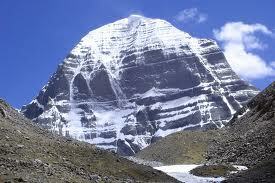 Mount Kailash is located 20 miles from Mansarovar; it appears like a giant Shivalingam placed in a 16 petaled lotus. Pilgrims first reach Darchin, and then start their 32 mile pradakshina or circumambulation around the sacred mountain. From Darchin, they proceed to Landifu, then Derfu, and then in a north east direction to Gowrikund 19000 feet above sea level. 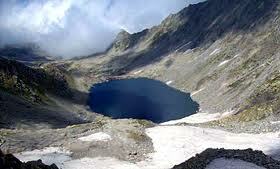 Gowri Kund in Tibet is known as Thuki Singbu. Then they go to Jandalfu and come back to Darchin. There are several Buddhist temples in this area. 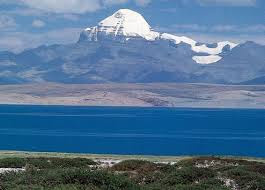 Travel 18 miles southeast of Kailash, and you arrive at the placid blue circular Lake Mansarovar, also known as Tso Rinpoche or 'precious lake' in Tibetan. Bathing in the freezing cold water of the lake which is said to contain miraculous powers is considered to be of massive spiritual benefit. The duration of the Yatra is 26 days. In addition, Yatris will need to spend 4 days in New Delhi to obtain visas, undergo a comprehensive medical examination and complete other formalities. This year, 16 batches each consisting of a maximum of 60 pilgrims will take part in the Yatra. The first batch is expected to depart from New Delhi in the last week of May/first week of June and continue till the end of September 2008. Applicants should ensure that they possess an Indian Passport. The cost of the Yatra will include Rs. 19,250 to be paid to Kumaon Mandal Vikas Nigam (KMVN), Rs. 1,950 to be paid to ITBP for medical examination / tests at Delhi, and US$ 700 to be paid to the Chinese side, besides additional expenditure on equipment, clothing, food, baggage, ponies, etc. Complete applications in the prescribed format should be sent to Under Secretary (EA) Room No. 255-A, South Block, Ministry of External Affairs, New Delhi-110011 in mid-March every year as stipulated by the Government of India. The selection of Yatris will be done by Ministry of External Affairs through a computer-generated random gender-balanced selection process.